Generic medicines are authorised copies that are the same as the brand-name version. They are exactly the same in dosage, safety, strength, method of action, quality and performance. The only difference is in the price. Generic medicines are considerably cheaper than their brand-name counterpart. Generic drugs are less expensive because generic manufacturers don't incur the same development costs. New drugs are very costly and are developed under patent protection. The patent protects the investment of the original developer by giving the company the sole right to sell the drug while the patent is in effect; normally 20 years. As patents come to an end, other manufacturers can apply to sell generic versions. Because those manufacturers don't have the same development and marketing costs, they can sell their products at substantial discounts. Once generic drugs are in common use, there is greater competition, which also keeps the price down. Today, almost half of all prescriptions are dispensed with generic drugs. Sometimes, generic versions of a drug have different colours, flavours, or combinations of inactive ingredients when compared to the original medication. Trademark laws in some countries do not allow the generic drugs to look exactly like the brand-name preparation, but the active ingredients must be the same in both preparations, ensuring that both have the same therapeutic effects. The Minoxidil Club believes totally in the efficacy of Minoxidil and Finasteride. They are without doubt the only medications that are clinically proven to effectively treat male pattern hair loss. In fact, stated simply, there is no viable alternative to buying Minoxidil and Finasteride if you suffer from male pattern hair loss and you wish to regain and maintain your hairline. Minoxidil Club founder members recognise that treating your hair loss represents a considerable financial investment and we have always worked hard to provide the best value brand-name products at reasonable prices. Now, the patent protection on Minoxidil has expired, it has become possible to purchase Generic Minoxidil from the same reputable hair loss clinics that supply our usual brand-name medication. If you are already a Minoxidil Club customer, you can save money by switching to Generic Minoxidil. We guarantee that Generic Minoxidil contains exactly the same active ingredients as your usual brand-name version. For those of our members who prefer to purchase brand-name products, genuine Minoxidil branded as Regaine will be available as usual. We will always supply both products...the choice is yours. 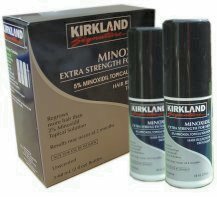 5% Kirkland Signature Generic Minoxidil lotion is exactly the same as Regaine but is made under license and represents exceptional value. It is supplied by the manufacturer in a 90 day format. £44.99 for a 90 day full treatment plan click to BUY PRODUCT CODE AA. It's so easy to order your Minoxidil and Finasteride from The Minoxidil Club. Our aim is to provide our customers with the lowest priced products in the U.K, so we are happy to accept your order by post and your payment by personal cheque or money order. Everything we need to know is included on our new Priority Order Form. Just click on any 'product picture' or 'Order Products' sidebar link and go straight to the Orders page; click on the 'BUY' links then download and print your personal copy of the Order Form directly from your own computer. When you're ready to order, just fill in the form off-line and post it to us. Mail order has never been so convenient.